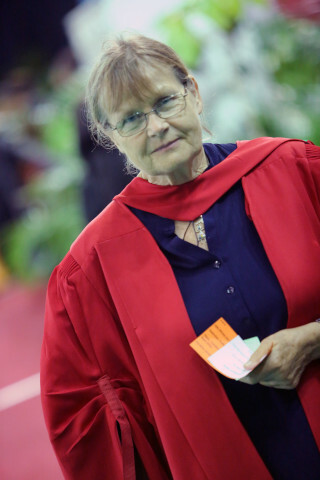 Durban – South African Child Rights activist, Joan van Niekerk, graduated with a PhD in Social Work from the University of KwaZulu-Natal this week. Her PhD study has provided recommendations for the creation of a developmental model for child protection services in the country. In her research, Van Niekerk, the former director of Childline, explored transformative shifts and challenges in the provision of child protection services. After interviewing senior social workers in the Eastern Cape, Gauteng and KwaZulu-Natal, Van Niekerk found there were many factors that contributed to these challenges. She found that services are severely hampered by the lack of an over-arching child protection strategy and a dysfunctional relationship between the non-profit sector and government and inadequate resourcing. Van Niekerk, who co-authored A Practical Approach to the Child Justice Act has worked in the child protection field for 28 years and has actively promoted the prevention of child rights violations and abuse, as well as appropriate responses to abused children and their families. She completed a Masters degree in Medical Science (Medical and Psychiatric Social Work) at the University of Durban Westville in 1983. Joan spent 24 years at Childline, initially as director of Childline KZN and then as National Co-ordinator of Childline South Africa. She chaired the South African Law Reform Commission Project Committee on Sexual Offences, and participated in consultations that resulted in the initial drafts of the Children’s Act 38 of 2005 and the Child Justice Act 75 of 2008. She is currently a member of the Professional Board for Social Work and the President of the International Society for the Prevention of Child Abuse and Neglect.